The global horseracing year 2011 will be remembered as an exceptional year marked by two truly outstanding performers in the British trained three year old miler colt FRANKEL (GB)  and the older Australian sprinting mare BLACK CAVIAR (AUS) . Both horses remain undefeated and both remain in training for 2012 when hopefully they will be fully tested and their still latent potential to improve further may yet be exposed. 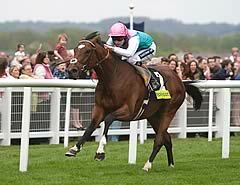 FRANKEL (GB)  was the joint champion European juvenile colt in 2010 and remained undefeated during 2011 winning 5 races, 4 of which were Group 1 races with his best rating of 136 being achieved when he defeated champion older miler CANFORD CLIFFS (IRE)  by no less than 5 lengths in the Qipco Sussex Stakes (G1) at Glorious Goodwood. But surely his most visually arresting performance was when he sensationally spread-eagled the field from the start in the Qipco 2000 Guineas (G1) at Newmarket. His rating of 136 marks him out as the joint top rated colt, along with crack Irish colt SEA THE STARS (IRE) (2009), since the World Thoroughbred Rankings (WTR) were instituted in 2004 and one would have to go back to 1984 and another Irish colt EL GRAN SENOR (USA) (with a rating of 138 in the former “International Classifications”) to find a miler of comparable quality on official ratings. BLACK CAVIAR (AUS)  was world champion older sprinter in 2010 with a rating of 123 and she remained undefeated during 2011 when her rating increased to 132 as a result of her astonishingly dominant weight carrying performance in the Lexus Newmarket Handicap (G1), which she won eased down by 3 lengths from the cream of Australia’s sprinters who were in receipt of considerable weight allowances. All in all, she won no less than 6 Group 1 races and 2 Group 2 races during 2011 and she has not only surpassed SO YOU THINK (NZ)  (2010) as the highest rated Australasian horse since the inauguration of WTR in 2004 but one has to go back to the mid / late 1980s to find fillies/mares with comparable ratings under the old International Classifications, namely the French filly MIESQUE  (1987 and 1988) and the British trained filly PEBBLES  (1985). The Singaporean trained older gelding ROCKET MAN (AUS)  and the Australian trained three year old colt SEPOY (AUS)  additionally confirmed the strength of the sprinting division in Asia / Australasia during 2011. ROCKET MAN (AUS), who was rated 121 in both 2009 and 2010, increased his rating to a mark of 125 following dominant performances in the Dubai Golden Shaheen (G1) (Sponsored by Gulf News) at Meydan and on home turf in the KrisFlyer International Sprint (G1) at Kranji racecourse in May. His mark of 125 would make him the top older male sprinter since WTR commenced in 2004. SEPOY (AUS)  was the top Australian juvenile colt and has continued his progress in the first part of his 3yo season with 5 wins including 2 Group 1 races, the Sportingbet Manikato Stakes (G1) at Moonee Valley and the Perri Cutten Caulfield Sprint (G2) at Caulfield and with a rating of 123 from both of those races, it marks him out as the top WTR three year old sprinter since the British trained OASIS DREAM (GB)  back in 2003. Staying in Asia / Australasia, the Japanese trained three year old colt ORFEVRE (JPN)  became only the seventh colt ever to win the Japanese Triple Crown but he managed to go one better than the last Japanese triple crown winner – DEEP IMPACT (JPN) ( as a three year old in 2005) and defeat the older generation in the Arima Kinen Grand Prix (G1) at Nakayama racecourse, which included the world joint top older mare (over 12f / 2400m) and 2011 Japan Cup winner BUENA VISTA (JPN)  and the Dubai World Cup winner VICTOIRE PISA (JPN) . ORFEVRE’s performance in winning the Kikuka Sho (G1) (Japanese St Leger) with a rating of 122 in the staying category makes him joint top 3yo stayer along with the British trained CONDUIT (IRE)  (2008) since the WTR began in 2004. 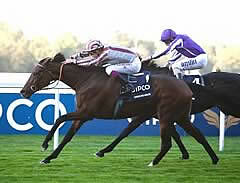 Turning to the older horses in Europe, the champion older horse over 10-12 furlongs (2000m / 2400m) was the French trained gelding CIRRUS DES AIGLES (FR)  who, having been rated 117 in 2009 and 118 in 2010, improved consistently throughout a typically busy campaign, and achieved his best performance at the inaugural British Champions Day when winning the Qipco Champion Stakes (G1) at Ascot. Among the vanquished that day were the former Australian now Irish trained horse SO YOU THINK (NZ) , who was remarkably consistent throughout 2011 and who achieved the same rating as he did in Australia in 2010 in winning three Group 1 races, and the top rated European three year old colt in the 10-12f (2000m / 2400m) category, namely the British trained NATHANIEL (IRE)  whose best performance was in winning the King George VI and Queen Elizabeth Diamond Stakes (G1) (sponsored by Betfair) at Ascot. The French trained stayer AMERICAIN (USA)  failed in his bid to win the Emirates Melbourne Cup (G1) in consecutive years but his valiant weight carrying performance in finishing fourth meant that he improved his 2010 rating from 121 to 123 and that rating makes him top older stayer in 2011 and joint top older stayer (along with DEEP IMPACT (JPN) (2006)) since the WTR commenced in 2004. The German trained DANEDREAM (GER)  was the standout filly among the classic generation in Europe with a scintillating success in the Qatar Prix de l’Arc de Triomphe (G1) at Longchamp which followed on from her earlier Group 1 successes in the Rhineland Preis and the Longines Grosser Preis von Baden in Germany. Her rating of 128 ensures her top billing among the classic generation of fillies (along with the great French filly ZARKAVA (IRE) , who also won the ‘Arc’) since the commencement of the WTR. Other notable European trained fillies/mares from 2011 include the brilliant but now retired French mare GOLDIKOVA (IRE)  who won a further two Group 1 races before finishing second to top 3yo filly miler in Europe, IMMORTAL VERSE (IRE) , in the Prix du Haras de Fresnay-le-Buffard Jacques le Marois (G1) at Deauville. IMMORTAL VERSE (IRE)  shares the mantle of top 3yo filly miler in the world with the impressive Australian filly ATLANTIC JEWEL (AUS) , who won the Schweppes Guineas (G1) at Caulfield, but whose stunning performance over 10f (2000m) in the Wakeful Stakes (G2) at Flemington also makes her the top 3yo filly in the world over that distance, and marks the first time an Australian filly from the classic generation has achieved this WTR accolade. It was a relatively undistinguished year for North American racing in 2011, with the top older performance being put up by the four year old colt DROSSELMEYER (USA)  in winning the Breeders’ Cup Classic (G1) at Churchill Downs where among the vanquished was 3 time Group 1 winning and top older dirt mare HAVRE DE GRACE (USA) . CALEB’S POSSE (USA)  proved the most progressive of the classic generation with his Breeders Cup Dirt Mile (G1) being rated the top dirt performance of 2011 by a 3yo, just ahead of the first two winners of the Triple Crown races, namely ANIMAL KINGDOM (USA)  and SHACKLEFORD (USA) . The best performance by a three year old filly on dirt was undoubtedly that of ROYAL DELTA (USA)  in winning the Breeders’ Cup Ladies Classic (G1).